"Last Saturday Larry Williams Jr. went down to the EVENING STAR alone and watched the big presses turn over. He was the city editor's guest…He showed how they made stencils out of lead. To get the eight presses working and ready to print papers for the city took fifteen minutes, and only two seconds for each section to come through the presses." The Thornapple Street News November 14, 1931. CCHS 1989.27.01. The Chevy Chase children's newspapers were not merely ways to have fun. The young reporters took their work seriously and put a tremendous amount of effort into producing their newspapers each week. They gathered news stories, chose content, produced the newspaper and distributed it throughout the local community and beyond. Through this process they gained valuable skills in inquiry, interpersonal communication, social skills, decision making and meeting deadlines. The community provided safety and support, as well as encouragement from parents and neighbors who took the newspapers as seriously as the children did. 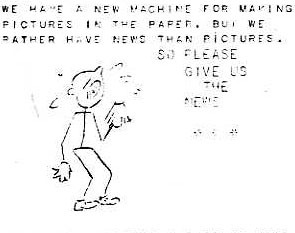 "We have a machine for making pictures in the paper, but we rather have news than pictures. So please give us your news" The Thornapple Street News January 30, 1932. CCHS 1989.27.01. Whether it was The Thornapple Street News reporters going door to door or The Leland Street Sunday News reporters making their weekly telephone calls, the neighborhood could depend on the young reporters making the rounds to gather the news. The children got stories and updates on visitors, home repairs, pets, vacations and more. "New Jobs? New Pets? New Appliances?" "We wish that people's children would not bite the reporters when they come to get news. It is bad enough to be bitten by dogs sometimes." The Thornapple Street News, December 10, 1932. CCHS 1989.27.01. 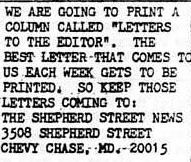 A call for Letters to the Editor from the staff of The Shepherd Street News September 2, 1972. CCHS 1989.27.01. The Letters to the Editor weekly column gave readers a chance to share, opinions, stories and community updates that went beyond the questions the staff may have asked; they give insight into Chevy Chase life in the 1970s. The Shepherd Street News, July 29, 1972. CCHS 1989.27.01. "REMEMBER…SUGGESTIONS, RECIPES, CROSSWORD PUZZLES, LETTERS TO THE EDITORS AND JOKES, RIDDLES AND SAYINGS ARE ALWAYS WELCOME. ALSO, IF YOU HAVE ANY THING THAT YOU ESPECIALLY WOULD LIKE PRINTED IN THE LELAND STREET SUNDAY NEWS, PLEASE PREPARE IT AHEAD OF TIME AND GIVE IT TO THE EDITORS OR CALL THEM UP AND TELL THEM. THANK YOU." The Leland Street Sunday News, March 23, 1975. CCHS 2010.1015.02. Given their limited amount of time and actual page space available, the young reporters had to make decisions about what to place in their paper. The newspapers were first and foremost an opportunity for the children to have their interests and voices heard. "America has joined in with the League of Nations to try to stop a war between Japan and China. Nobody here wants war any more, and we hope the other countries don't." "Print only good news, stay out of politics, and have a good time!" March 16, 1975. CCHS 2010.1015.02. Click next to learn how the newspapers were produced!